Innovation is here. The Force is with it. It's easy to label Rovio Entertainment's newest effort, Angry Birds Star Wars, as a cheap cash-in, further proof that Lucasfilm will seek to merchandise its cash cow at all costs. On the flip side, this is quite a blockbuster collaboration between two super powers in the entertainment business. On one side, there's Rovio, the development studio that helped put smartphone and tablet gaming on the map with the original Angry Birds. Lucasfilm, meanwhile, literally built an empire off George Lucas' sci-fi franchise. Regardless of where you stand, one thing's for certain: this is more than just a sequel to Angry Birds. That said, the award-winning formula is alive and well. A handful of videos showcase the familiar Angry Birds gameplay, with feathered friends of various colors and sizes launched into forts containing their archenemies, the green pigs. 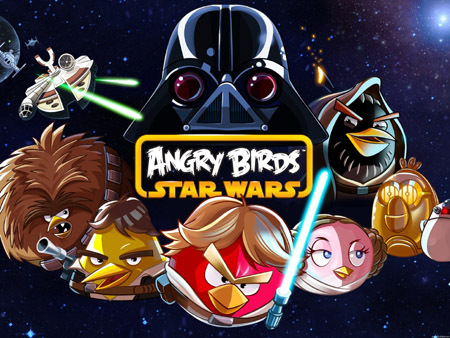 Suffice to say, if all you want is more of the same, it would appear Angry Birds Star Wars delivers. Thankfully, it goes a bit deeper. For starters, there's the Star Wars license, which Rovio appears to have blended wonderfully throughout its creation, and it begins with the characters. The popular red bird steps into the role of Luke Skywalker, while the bomb bird slips in Obi-Wan Kenobi's Jedi robes. The pink bird, meanwhile, is Princess Leia, while the yellow bird becomes that scoundrel, Han Solo. Even C-3PO, R2-D2 and Chewbacca make an appearance. As for the pigs, they fit right into assumed roles, like Darth Vader, Stormtroopers and Tusken Raiders. Thing is, these are more than just costumes. Characters also possess unique abilities in line with their new personas. Skywalker unleashes a spinning lightsaber attack that cuts through just about everything. Han Solo fires some well-placed shots from his blaster, and it would appear Obi-Wan can Force Push. Then we have C-3PO, who breaks apart, the pieces wrecking havoc, and R2-D2 has some sort of electrical powers; keep in mind that R2-D2 gave Salacious Crumb a jolt in Return of the Jedi. It's safe to guess that such powers will present never-before-seen solutions to a variety of imaginative puzzles that go beyond sling-shooting birds into things. In other words, the Angry Birds mechanics are about to change, perhaps for the better. Not only that, but it appears Rovio nailed the presentation. Expect to see locations inspired by Mos Eisley, Hoth and the Death Star. Makes us very excited for downloadable content, since there are more than enough Star Wars hotspots to explore. On that note, we can't wait to welcome this new chapter in the Angry Birds saga. Look for it tomorrow, November 8, on iOS, Android and other platforms. In the meantime, cross your fingers that it lives up to the hype.